Project obstacles and solutions: In 2012, the City of Lafayette, Indiana signed an agreement with the State of Indiana to take over control of the portion of U.S. 52 - the Sagamore Parkway - running through Lafayette. The city drew up plans to update and separate the storm sewers from sanitary sewers along 2.5 miles of the parkway, build new sidewalks and city trails along the highway, update traffic operations and safety concerns, upgrade railroad crossings, plus improve traffic flow and drive quality. The master plan broke the improvements into three phases. Rieth-Riley Construction was hired to handle Phase II of the project. This project had a number of complex challenges. Building new sewers and expanding a busy street lined with businesses that stayed open during the construction process was a challenge. There was pressure, both from the community and the local government, to get the work completed as quickly as possible. This project required multiple concrete mixes that had to be delivered on time and to specifications. This included flowable fills that served as a bedding for the sewer lines. IMI provided 150 yards of imix Flexifill, which is designed to be self-leveling and sets up in minutes so that the pipes could be covered and graded in the same day. During the excavation of the new streets, IMI provided a slurry mix for soil stabilization under the roadway. Since one side of the road was open during construction and there were multiple businesses that front the parkway, a wet, slurry mix was used to keep airborne dust to a minimum. Specialties Company provided the soil stabilization services. IMI provided 675 yards of slurry mix for this part of the project. The new curbs and gutters, sidewalks and medians required a paving mix that worked with Rieth-Riley's slip-form pavers. 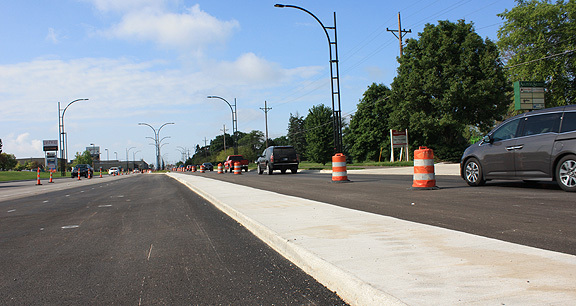 IMI QC/QA worked with Rieth-Riley to provide 1,300 yards of curbing mix and 4,400 yards of paving mix. Of particular concern was the set times for concrete used at intersections of major streets. IMI suggested that an accelerating admixture be used on the paving mix at these intersections. IMI supplied 440 yards of concrete that achieved early strength so that they could be driven on within 72 hours of the pours. The highway also has a median retaining wall that stands between the northbound and southbound lanes just north of Union Street. This varies in height from 30 inches to 15 feet tall. The architectural design called for a cut-stone pattern to be used in the wall. IMI QC/QA designed a self-consolidating concrete to fill the forms without leaving a void and to provide a smooth finished wall. IMI provided 500 yards of concrete for the wall. Phase II of the Sagamore Parkway was completed in September 2016. For more information on flowable fills from IMI, click here. For more information on slurry mixes used to stabilize soil, click here. For more information on concrete designed for paving machines, click here.